Makes a perfect gift to give to anyone. This beautifully crafted pieces of jewelry is sterling silver/gold plated, and features an 18” gold rhodium plated chain. Large 3.3 Cm. 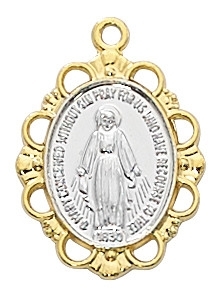 Sterling Silver MIraculous Medal LMG1 Sterling Silver Blue Enamel Miraculous Medal Our Lady of Lourdes Sterling Medal 14 KT Gold Miraculous Medal, 1" x 5/8"